Using the new timelines we had created for our users we were to take that information and define exactly what information should be being communicated to that patient at that point in the journey. Through this we put together a rough sketch of what a patient toolkit would contain, and how that could be formatted to help facilitate collaboration and a deeper involvement in a patient’s healthcare. Having worked out exactly what information we wanted to go into each section of the toolkit, we worked on producing a template which we could use to start creating individual pages digitally. 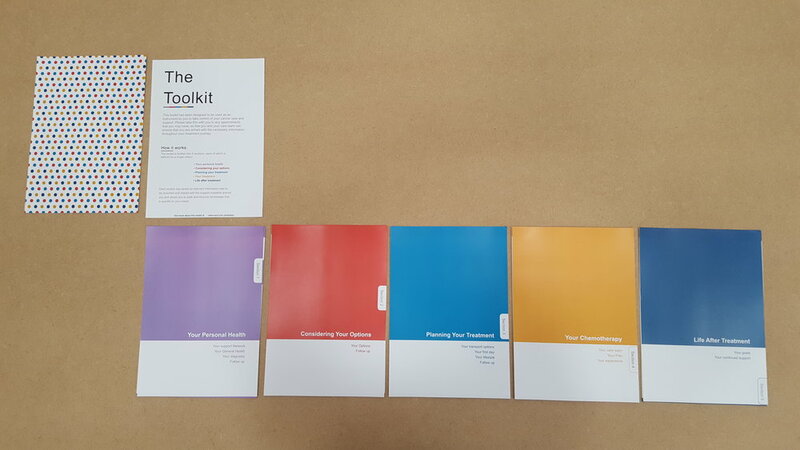 We split the work between the four of us, each taking a different stage of the patient journey and using the template created the toolkit pages. Having produced a prototype digitally, we needed to print it out and put together some prototypes for testing purposes. We made two different versions, and started planning out how to go about testing these within the hospital environment. The key things we needed was feedback from healthcare staff, and even more importantly feedback from the patients and their support. Today was a final opportunity to get some direct feedback about the toolkit concept. We went to Crosshouse to present our idea and get it in hands of both healthcare professionals and, ideally, patients. We got our first contact with two Macmillan nurses, and gave them a rundown of the toolkit, and how we hoped it would be utilised. The feedback from them was positive, with a suggestion that Macmillan would be the most likely stakeholder to realise the concept. We then had a brief one on one with a clinician who also felt positive about it, and wanted to get us testing it out with patients. We were able to get talking to a couple of patients who were receiving Chemotherapy treatment at that time. This testing gave us some great feedback for the concept, the users liked the concept, particularly the idea of having more control and more transparency of their healthcare. Much of the treatment focuses on the physical effects. A big takeaway from the day was to include more of the emotive, qualitative data in the toolkit, something that is often quite lacking through the patient’s journey. With less than a week remaining until the project we had a last meeting with our tutor to discuss how to present the work we have done and sell the idea to the our NHS collaborators. With that in mind, we began finishing up much of the content that we will be delivering come Thursday afternoon.